VietNamNet Bridge – Authorities and people living in the coastal areas of the Cuu Long (Mekong) Delta have taken several measures to prevent saltwater intrusion, including building of dams. Tran Binh Trong, head of the Kien Luong District Infrastructure Economy Bureau in Kien Giang Province, said the district has built a dam on Canal 6 to prevent saltwater intrusion. It would monitor the situation to properly regulate the operation of Lung Lon 1 and 2 sluices and Cai Tre Sluice, he said. In Kien Luong, saltwater has penetrated 15km into the Rach Gia-Ha Tien Canal and Canal 15. The Tien Giang Province’s People’s Committee has instructed relevant agencies to apprise locals about the saltwater intrusion situation. Last week, Hau Giang Province dispatched inspection teams to check works for keeping out saltwater. Lu Van Hung, chairman of the provincial People’s Committee, said the salt content in rivers and canals is still low but forecast to be more severe this year than last year. 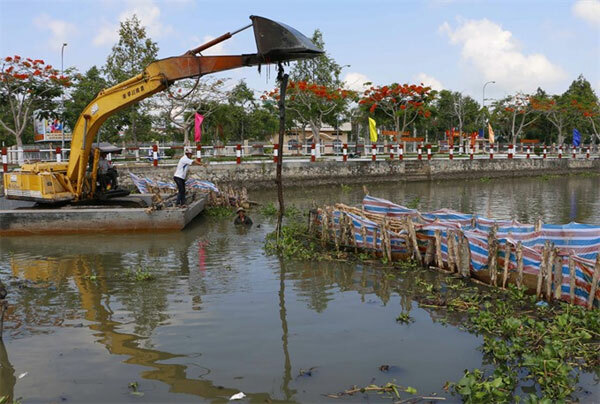 Hau Giang Province plans to strengthen dissemination of information to the public, regularly monitor salt content, build temporary dams, dredge canals to store fresh water and repair sluices, according to Tran Thanh Toan, head of its Sub-department of Irrigation. Last year, saltwater intrusion was not severe in Hau Giang Province and did not affect agricultural production much, according to the sub-department. In Ben Tre Province, with the delta entering the dry season, many households in coastal areas have to buy fresh water for agriculture and daily use. In its Ba Tri District, most farmers growing watermelon in An Thuy Commune have to buy water at VND100,000–120,000 (US$4.4 – 5.2) for 2cu.m, which is 30 per cent higher than last year. Tran Van Tan, who has 6,000sq.m under watermelon in the commune, said his crop is set to bear fruit and needs a lot of water. He estimated the irrigation water to cost him VND1.2-1.5 million ($44 - 66) for this crop. Truong Thi Lan in Ba Tri District said her family has installed containers to store more than 6cu.m of rainwater for drinking and cooking in the dry season, reducing the cost of buying fresh water for daily use. In the past, her eight-member family had to spend nearly VND1.5 million a month to buy fresh water from tanker trucks, she said. Tran Van Hoang, vice chairman of the Ba Tri District People’s Committee, said only 45 per cent of households in the district get clean tap water. The district is building two water filtering plants to supply clean water, he said.